Edinburgh Capitals’ winning-home-streak came to an end in controversial fashion at Murrayfield last night. They lost 3-2 to Nottingham Panthers after a Ryan Hayes short-handed goal with 19 seconds remaining was chopped-off as Panthers players surrounded referee Simon Hogarth, arguing that Edinburgh Capitals forward Craig McCallum had left the penalty box too early. The game was delayed for several minutes as Elite League-leading Panthers continued to argue their case, with Hogarth eventually overturning his original decision to award the goal. In truth, Hogarth made the correct call, McCallum had been given a four-minute penalty for high-sticks but left the box after two, following a miss-communication with the time-keeper, at which time the play should have been called dead. Caps went on to score five seconds later. The final 20 seconds were eventually played out, however no time was added to the clock. It will be argued that this was a hard-luck story for the Caps, who had won their last seven games on home ice. However, Nottingham were the better side in the third period, clawing back a two-goal deficit after Edinburgh had dominated the first half of the game. Before the game Capitals player-coach Riley Emmerson talked of his team controlling the puck and therefore the pace of the game. And Edinburgh were excellent in the opening period, dominating a Panthers team who looked lethargic despite arriving for the game a day early and pulling strings to ensure new Canadian defenceman Kyle Hardy, who only put pen to paper on Thursday, could make his debut after his paperwork cleared at the 11th hour. Panthers goalie, Mika Wiikman, had to be sharp in the opening minute, pulling off a double save from Jacob Johnston and Emmerson. Trevor Gerling also went close as Panthers blue-liner Steven Lee sat in the sin-bin after being called for interference. Edinburgh took a deserved lead six minutes in as Callum Boyd showed great speed to drive the net and fire an unstoppable shot into the top left-hand corner for his first goal of the season. Wiikman was again called into action soon after doing well to glove a Kyle Bigos slap-shot whilst being screened by the massive 6ft 8in frame of Emmerson. It wasn’t until Edinburgh ran into penalty trouble in the latter stages of the period that the visitors got themselves any kind of foothold in the game. 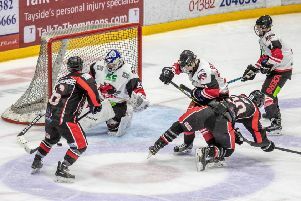 Soft penalties conceded by David Rutherford after he retaliated when knocked to the ice by Robert Farmer, and also Ryan Hayes for high sticks committed when Panthers were deep in their own zone, allowed Panthers to dominate the final minutes with Edinburgh doing well to kill both penalties. Panthers started the second period in bright fashion, bar a Brandon Coccimiglio effort that hit the post for the home side. But Edinburgh increased their lead with a move that began with an excellent Carsen Chubak kick-save to deny GB international forward David Clarke. Edinburgh broke up ice but the move appeared to have petered out until some excellent fore-checking, so prevalent in last week’s 4-2 win over Fife Flyers, won back the puck behind the Panthers net and Trevor Gerling fired a pass onto the stick of Rutherford who made no mistake with the finish. Edinburgh, who had performed heroics to thwart Panthers on a five-on-three power-play opportunity, committed the cardinal sin of concerning a short-handed goal in the final stages of the second period. Brad Moran scoring on a break-away after Chubak had been left hung-out to dry. Edinburgh did not look the same team after that, Nottingham, buoyed by the goal, dominated the final period, scoring through Evan Mosey, and with just under eight minutes left, Juraj Kolnik took the win and ensured momentum going into tonight’s second game of the weekend double header (face-off 5.30pm).